When thinking about Thailand, most people think about Phuket, Koh Samui, Koh Phangan or Chiang Mai. These places are mostly overrun by tourists, even though there are places where you will actually find a remote beach. During a flight to Lisbon in January 2016 I read the KLM aircraft magazine about two islands that were called a “hidden paradise”. They are located on the eastern coast of Thailand, just at the border to Cambodia: Koh Mak und Koh Kood. I decided to visit Koh Mak because it was the smaller of the two and check out Koh Chang, the biggest island at that coast and probably the most popular. Actually the KLM magazine was right: Koh Mak is a hidden paradise. There is no airport, so you will have to travel to Trat by Bus or plane. As flight were really expensive, we booked a bus from Ekamai Bus Station in Bangkok. It takes about 5-6 hours but you will see some parts of the country that are not touristically explored. We were the only tourists on the bus what made the expectation of going on a remote island even stronger. From Trat we caught a taxi to the pier and the speedboat. After almost 8 hours we finally arrived in our expected paradise. The island is actually small and we were so impressed as it actually looks like the beaches shown in movies about plane crash survivors. We had booked our accomodation in advance so we just caught a taxi to ride across the island. After the days in Bangkok it was so good to breathe the clean air and already catch a glimpse at the beauty of the island. At Ao Pong resort we actually felt like on another planet. The resort calls itself “The most chill place” and that is what it actually is. My first actual article here is a very personal recommendation. Traveling a lot around different European countries, I still have a preference that my sound weird to lots of people. I LOVE the Netherlands. My love is eternal and I’m coming to see my beloved country at least once a year. When growing up, this country was only a stone’s throw away, so I’ve always been coming here many times. Now I live at the other end of the country but I still manage to find slots for a visit, the airport is just around the corner and in about one hour I step on the ground of Holland. My personal force to come to the Netherlands again and again are the beaches and the food so today I want to tell about my favorite place. 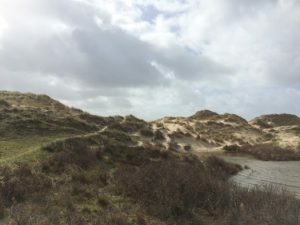 Having seen lots of beaches all over the world I am still like magnetically attracted by the beaches in the Netherlands. My absolute favorite place in the Netherlands is the small town of Egmond aan Zee. It’s located about 30 kilometers in the Northwest of Amsterdam. So it is perfect for a day trip! Letting the buzziness of Amsterdam behind you and straightly heading to the sea, you cannot miss Egmond. 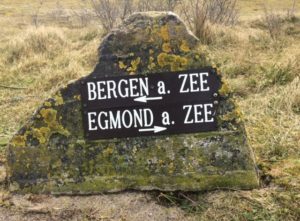 It’s divided into three parts: Egmond-Binnen, Egmond aan den Hoef and Egmond aan Zee which are all quite close together. As the name indicates, Egmond aan Zee is located directly by the sea. You can smell the ocean as soon as you leave the car. (There is no train station.) During off season, parking is free at the promenade but prices are also reasonable during peak season (Easter and summer holidays). Egmond is definitely not a party place such as Zandvoort. If you prefer partying, shopping and coffee shops, you should better choose Zandvoort, what is also a lovely place. It’s just more crowded than Egmond. 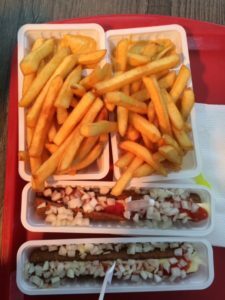 nd my ritual when arriving here is to have a frikandel and frites speciaal at the Beach Snacks bar in main street. You’ll get fries and sausage with ketchup, mayo and onions when ordering this. On our final evening we always eat at La Chatelaine, a higher class restaurant. refreshing visit to one of the beach bars there. There´s also the place of Bergen-Binnen, where you can go “skiing” on an artificial slope and a great pancake (and pizza) restaurant (you will have to drive here). take a walk or hike through the beautiful Noordhollandse Duinreservaat what looks like if you just landed on the moon. 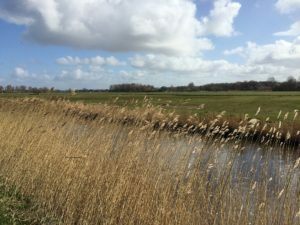 There are no party places and no coffee shops in Egmond (at a younger age we tried to find one but failed – I learned only recently that there do not exist any here). In case you plan to stay longer in the area and feel like driving around you shouldn’t miss the city of Alkmaar. It’s about 20 minutes to drive. Here you can watch the famous cheese market on Fridays where they transport the cheese to the market st alls with their traditional equipment and you can choose between a wide range of cheeses and try them. In the near future I have planned on traveling a lot more. My next destination will be the Netherlands (again). My love for this country is just exceptionally eternal. In my Amsterdam article you could already read about my favorite places in Amsterdam and the surrounding area. The new article will be about my favorite place at the sea: Egmond aan Zee. I’ve been traveling there for more than fifteen years since a friend showed me this cute little village by the sea. More destinations to come are an area in the west of Germany and some backpacking around Thailand. Be excited! Welcome to my blog! I’m glad you found my website. Another travel blog, you might think. Another travel blog among thousands of travel blogs available. But I’ll try to be different. I’ll try to explore places also in non-touristic areas and show town and cities especially in Europe that might not be so well-known yet. I’ve traveled a lot and there’s a lot more to come – so let’s get started. Author adminPosted on October 12, 2016 October 12, 2016 Leave a comment on Another travel blog?